Think about the last several times you had an experience less than spectacular. You left a business frustrated or hung up the phone more stressed than before you called. Unfortunately all of us can remember several probably in the past 48 hours. Next, think about contacting the company management about your dissatisfaction. If you are like most people, you don’t bother to waste your time. I never do. But then the customer service consultant voice starts talking to me on my way home. “Why didn’t you tell anyone? Ouch! This happens all the time. We do it as customers, and our customers are doing it to us!! If we are not making it easier for our customers to give feedback, then it is happening to us more than any of us realize. Our customers have better things to do with their time than hunt us down and complain. It is difficult to expect your front-line employees to handle service recovery when they have poor role models. 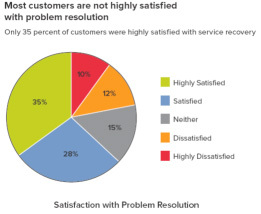 Service Management Group (SMG), headquartered in Kansas City, Missouri, who measures the customer experience for multi-unit businesses, found some startling information when tracking customer complaints. SMG discovered that managers were the main cause of the very worst problems. These were the situations in which a customer complained directly to the manager. But the manager made the original problem worse by being defensive or unwilling to solve the problem. One-third of worst problems-the ones where customers called into the company’s headquarters to complain-were about the manager’s failure to resolve the original complaint! There are several ways to give permission for our customers to communicate with us. Now I am not talking about satisfaction measurement devices that ask customers their level of satisfaction and how likely they are to refer. That is very vitally important, I spent an entire chapter on it (13) in What’s the Secret?. This is something totally different. I’m talking about giving your customers permission to communicate easily, in a non-threatening way; and not only giving them permission, but asking for their advice, their feedback, both positive and negative. Few companies ask their customers for praise, and lose the opportunity to celebrate and perpetuate that type of outstanding performance. However, very few companies have the courage to ask their customers for feedback if their experience was below what they were expecting. Here’s a refreshing approach. When you shop for a car at Motorcars Honda/Toyota in Cleveland Heights, Ohio, you will notice a red phone in the middle of the showroom with a sign that reads: “Hotline to Owner Chuck Gile.” Customers know that if any issues arise, they have the power to talk to the top executive in the organization. That provides great peace of mind and a zero risk of doing business with a company. On top of that, the red phone sends a message to all employees, demonstrating the lengths Motorcars will go to make the customer happy. Grillsmith Restaurant, a Tampa-based chain, posts a sign that says, “I want to hear from you” with the GM’s picture on it and all the contact information, including the cell phone number. John Robert’s Spa rolled out an Experience Guarantee, where guests can pay what they think is fair if they were not totally satisfied with their experience, no questions asked. Did JRS get burned? Hardly. Any time John Robert’s got “short paid” it was deemed justifiable by the Salon Coordinator. It gave JR great feedback on who were the employees not providing the experience promised and more than 80% of the guests who didn’t pay full price, returned again. 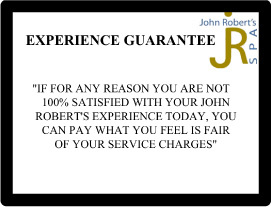 John Robert’s retained 80% of their dissatisfied customers! I would say it is working. Did we miss? Tell us, please! Was someone a hero for you today? We want to recognize them. Were we the best part of your day? If you can’t answer yes, that is unacceptable to us. Please share with us why we were not. How easy are you making it for your customers to share their experiences? Do you give them the impression you care, that you want to know, that exceptional experience is the only thing you will accept? If you are not getting enough complaints, that may be telling you something.